What do we want to achieve on the market? Where are we now and what’s missing to be able to reach the marketing targets? How mature is my company and the targeted customer segment regarding digital marketing and mobile devices? 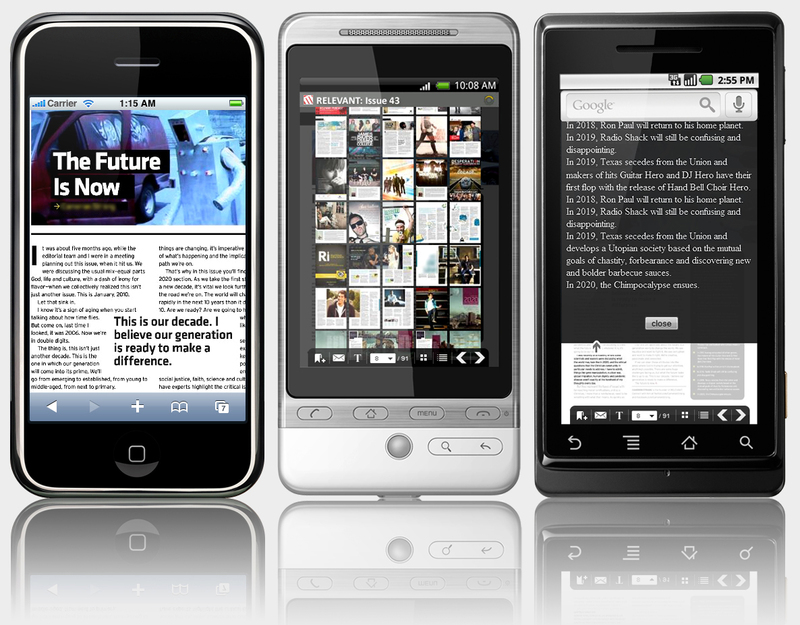 How glossy and rich does the mobile experience need to be? How much can I allow this to cost per impression/interaction etc? How flexible should the chosen solution be, would I like to add new features and services? 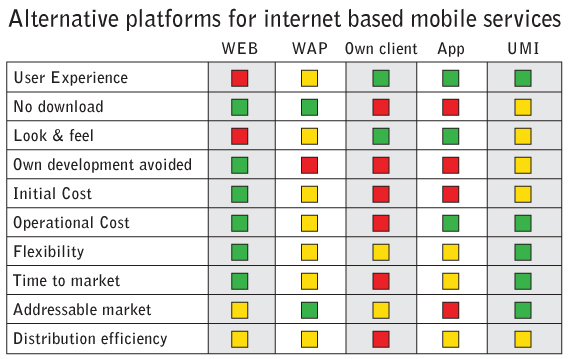 The table compares different solutions for Internet based mobile market communication. The solutions compared are: web – just let customers brows the existing web site over the mobile; WAP – mobile format site based on WAP; own client – separate java client to be downloaded as any java client; app – application for an app store; UMI – integration of existing web services to a UMI platform. The properties listed are: user experience; no need for a client to be down loaded; look and feel; own development needed; initial cost; operational cost; flexible and can easily be upgraded with new functionality; time to market; addressable market; distribution efficiency – how easy is it to get customer to get started using the service. As can be seen in the table there are some key considerations to make depending on the ambition level and the expected value of mobile marketing. My key point is of course to illustrate the strength of UMI compared to other alternatives. Whether UMI is the best option does however depend on what you would like to achieve. I feel that many companies rush into exploring the possibilities with mobile marketing without first really analysing what it is there to accomplish and how it supports the overall marketing strategy. I strongly recommend all to view mobile marketing as one out of many components in the marketing communication mix and also that all options are carefully considered to avoid unnecessary costs and getting stuck in a solution that is impossible develop further to meet future needs.